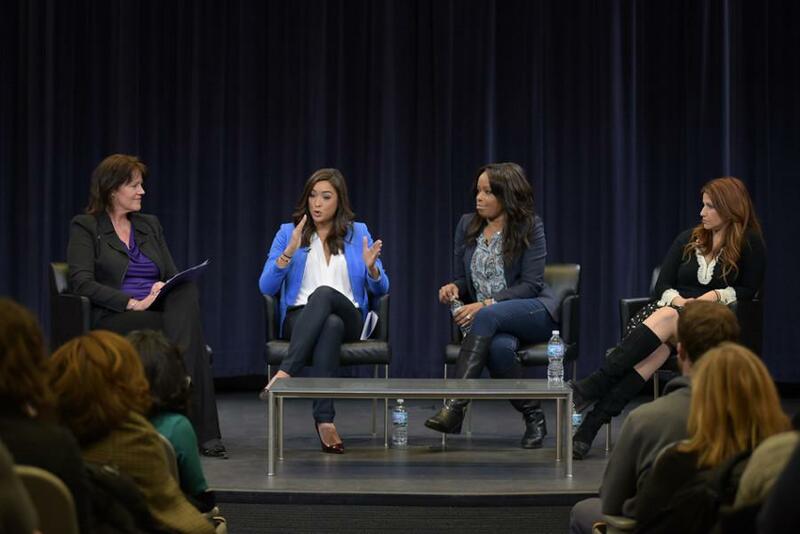 Christine Brennan (Medill ’80, ’81), Cassidy Hubbarth (Medill ’07), Pam Oliver and Rachel Nichols (Medill ’95) discuss women in sports media at a panel Tuesday. The panel was the fifth installment of the “Beyond the Box Score” lecture series hosted by the Medill School of Journalism, Media, Integrated Marketing Communications and Northwestern Athletics. Christine Brennan (Medill ’80, ’81) joined three of her fellow trailblazers from different generations and fields of sports journalism to discuss the female voice in sports media Tuesday. There was standing room only in the McCormick Foundation Center Forum for the four-person panel that tackled subjects including the role of social media and personal brands in journalism as well as the trope of the female sideline reporter. The panel is the fifth installment of the “Beyond the Box Score” lecture series hosted by the Medill School of Journalism, Media, Integrated Marketing Communications and Northwestern Athletics. Brennan, a USA Today sports columnist and author and commentator for ABC News, CNN and NPR, moderated the event. Brennan began the event by asking the panel their thoughts on the status of women in sports journalism. Rachel Nichols (Medill ’95), CNN’s sole sports anchor, said the strides women in sports media have made can’t be ignored, but there is much improvement to be made. Cassidy Hubbarth (Medill ’07), an ESPN anchor and host of NBA Tonight on ESPN2, said women can now explore more opportunities than before. Fox Sports reporter Pam Oliver said staying true to the craft of journalism is the most important. She wants to see “passion and heart” in young journalists, not just a desire to be on television. The panel also discussed their starts in journalism, and during the half-hour Q&A session that ended the event, the panelists answered audience questions about how to deal with career rejection and the biggest misconceptions about female sports journalists. Near the end of the panel, Brennan shared advice about journalism and life in general. “Stay focused on what you love, and you’ll never work a day in your life,” she said. Medill junior Megan O’Brien, who attended the panel and is interested in a career in sports journalism, said the panelists were inspiring. Medill freshman Will Greer said he was happy to hear about misconceptions about women sports journalist being addressed. “It was good to see how these women had broken through past assumptions and how people thought of women sports journalists and that there is no clear path to break through the barriers,” Greer said. Medill Prof. Charles Whitaker, who heads up the sports journalism initiative within Medill’s graduate program, helped organize the panel. He also serves as a board member for Students Publishing Co., The Daily’s parent company.